For patients with very high levels of nearsightedness, laser vision correction may not be appropriate and you may want to seek a LASIK alternative. In such situations, the Visian intraocular contact lens can be placed inside the eye to correct nearsightedness. This is an outpatient surgery where the new lens is placed behind the iris (colored part of the eye) and the natural lens. The Visian yields excellent contrast of vision. This does entail a surgery, so there are slightly higher risks of bleeding or infection, as well as a low risk of cataract formation. If patients have high astigmatism as well as nearsightedness, we may need do a staged procedure and correct the astigmatism first (to change the cornea from a football shape to a spherical shape) either with an in-office reshaping procedure or with Intacs. 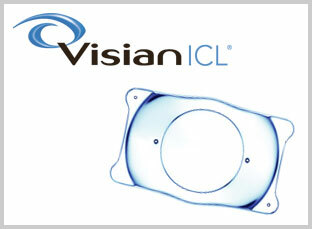 Then about a month or two later, once the corneas have stabilized, the Visian ICL can be implanted. After Visian with Dr. Ambati in Eugene, patients can generally see well enough to drive the next day and can return to work within 1 or 2 days, though they should not lift anything heavy for a week or rub their eyes. No stitches are required; the incision can be sealed with tissue sealant (which is like glue).